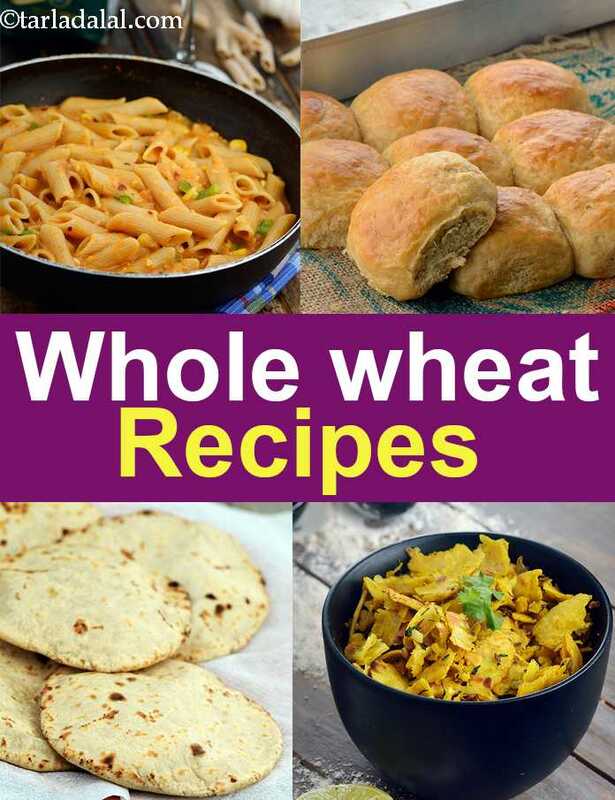 40 Whole Wheat Indian Recipes, Atta Recipes from breads, wraps, naans to rotis. Whole wheat recipes is the corner stone to living a healthier lifestyle. As the name suggest, its Whole and not a refined product. To live a healthy life and one without falling sick on a regular basis you need to shift to eating more intelligently. Say yes to fresh fruits and vegetables and opt for whole wheat products and not its refined version. Make healthy choices. Say no to maida or refined flour and yes to whole wheat. What does whole wheat do to you? Its simple, the body takes time to digest products once eaten with whole wheat and hence don't raise your blood sugar rapidly. As a result consuming whole wheat products will keep you fuller longer and make you feel healthy. You won't have those surges in energy as you get when having a biscuit or cookie or doughnut. With whole wheat products you feel good all the time and stop the mad craving for sugar or refined products. Try some of our classic whole wheat recipes like Whole Wheat Bread Rolls instead of Bread Loaf. Try this classic Whole Wheat and Vegetable Khichdi instead of Makai ni Khichdi as corn is not healthy. Make your pasta healthier by following Whole Wheat Pasta in Low Calorie White Sauce instead of Pasta in White Sauce.